Writing about Stan and Ollie is a many faceted challenge. Will audiences respond to the humor they peddled with such huge success starting in 1937? What are the ages in the audiences now loving this movie? It’s great fun to report that director Jon S. Baird as done a beautiful job of directing. The score is just right, and the actors have caught the mood of their characters and their time with great skill. 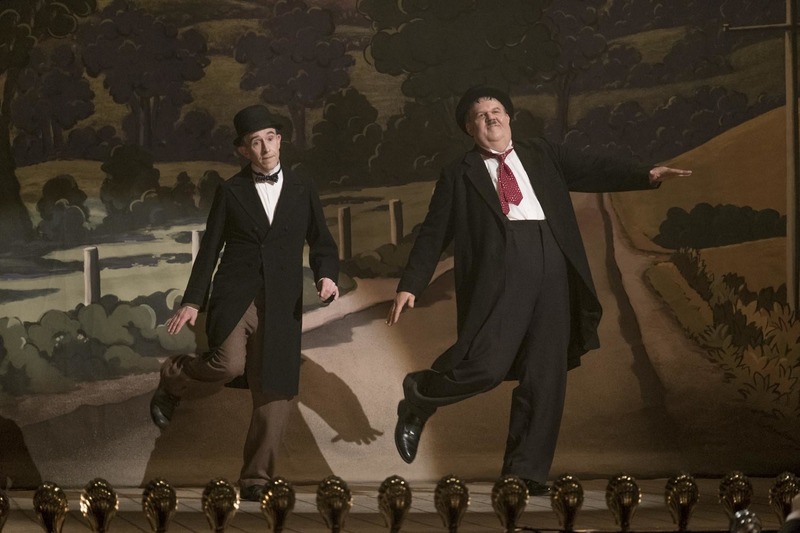 Stan (Steve Coogan) and Ollie (John C. Reilly) have only memories of the packed houses who roared with laughter at their early acts. The movie begins sixteen years later with a few people scattered through empty seats as the two are about to leave for England where Stan has arranged a performance date. As they play to mostly empty theaters, their mood begins to sink even more than it had in America. The two men who had delighted crowds for years are learning slowly that their time is over. The affection of the public who loved them has evaporated with changing times. Melodrama might easily have ruined this story. Instead, we soak up their love of performing, their love of each other, and the lingering memories in their public. All this unfolds as they begin to realize that as they have grown old, they have become unfamiliar to audiences. Audience tastes have changed. Their gradual realization of all this is sad because it is done so beautifully by director and actors. Repeatedly we in the audience are behind the two as they play to nearly empty houses. Steve Coogan and John C. Reilly play Stan and Ollie with extraordinary subtlety as the two men begin to understand their time is over. No grandstanding here, just a quiet, mostly unspoken realization as they perform their old winning tricks before a few people who still appreciate them. These two performances, set against just right music and without melodrama are moving audiences in unexpected ways. It is the portrait of two men in career decay who want terribly not to stop. Add to that two quietly moving performances by two loyal wives who arrive in London to follow their husbands in their slow and sad descent. Lucille (Shirley Henderson) and Ida (Nina Arianda) squelch the reality of their husbands’ sadness while becoming instead a caring, supportive team. Of the four who create these couples, each one becomes understanding of talent outdistanced by time, of new generations absorbed by new kinds of music. Another gift from the makers of this movie is the reality of what happens when successful performers stay beyond the changing culture. We have learned more about the thrill of roaring appreciation that keeps actors going as well as how it decays as times change. And we are given a deeply moving portrait of what it must be like for hugely successful performers to face empty houses as they face lives of old age outside the theater. This review was posted on February 4, 2019, in Biography, Comedy, Drama. Bookmark the permalink.